Welcome to a very special blog hop to celebrate a special lady on her special day! This is a bridal shower, blog hop stylee! The sweet Chaitali (of Iron Craft fun fame) suggested that we celebrate the owner of Uniko Studio, Bev's, forthcoming nuptials in this fun way and we, the Uniko Studio DT, jumped on board straight away! I couldn't resist adding a panel of Hawaiian Shores card behind the aperture I cut with the die. Not only does it add a splash of colour to the design, it also symbolises the destination of Bev's wedding: Hawaii! Lucky thing! I originally wanted to place a mega-sized piece of bling to the centre of my flower but didn't have anything big enough. (Note to self: purchase mega sized bling!) So I gathered a few different sizes of bling and arranged them in this little circular pattern. To add a bit more depth to the leaves around the flowers I stamped them twice on each side without reinking my stamp (aka Generation Stamping). You know the deal by now: you see the card, you get inspired (by anything - and I mean anything!) from it and get busy. Simple. I performed a bit of 'stamp surgery' for this card. That's right, I administered the scissors to a stamp - gasp! I chopped a 'happy birthday' stamp into two and used just the 'birthday' part. Don't worry, the two parts line up perfectly again on my block for when I need the full sentiment. It saves on fussy, selective inking! I prefer to stamp and emboss my sentiment before die-cutting my shape. It allows me to control where the sentiment will be on the die cut shape with greater ease. Plus it's easier to stamp and emboss on a larger piece of card than a smaller one. I simply use a post-it note to secure the die in place before running it through my Cuttlebug. See those chevron stripes? Its tempting to just stamp one long border down the side, but I purposely stamped the design once at the top, then flipped the stamp and stamped it at the bottom. This way the design helps to guide your eyes to the sentiment. Now I said this was a bittersweet CASE Study and it truly is as our teamies, Moe and Teneale are stepping down *sob*. I hope you ladies know that I'll still be stalking your blogs in the future! Thanks so much for popping by today. I've gotta dash and deliver this card and this gal is hoping that there's birthday cake on offer! 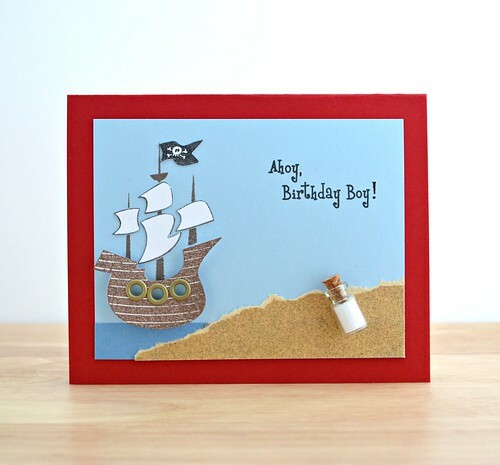 While I was away, it was my nephew's birthday so cue another birthday card whipped up by one of my all time favourite sets to use for little guys, Clearly Besotted Stamps Ahoy Matey! (Which now has coordinating dies - sweet!) Man, I hope my nephews don't ever tire of pirates....I can see them getting pirate cards from me well into adulthood! Ha! This card incorporates some texture in the form of sandpaper. Seeing as I'm unlikely to use the stuff for DIY projects, it seemed apt to use it for a beach/desert island. 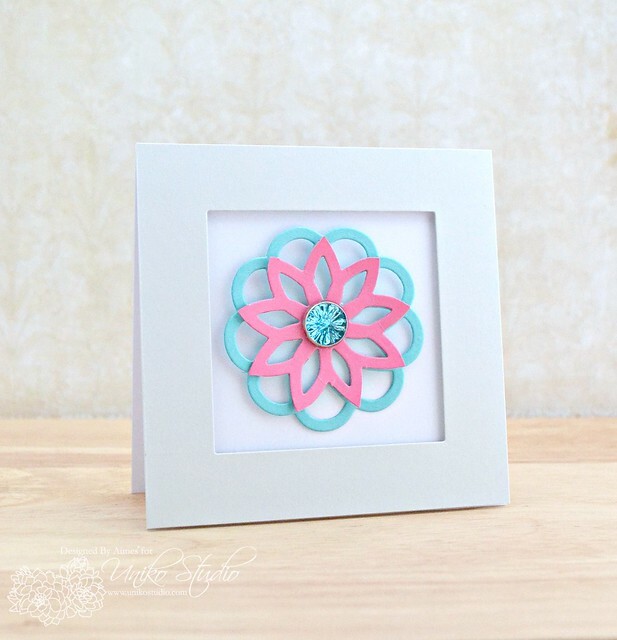 Don't be afraid to use non-cardmaking supplies on your projects. 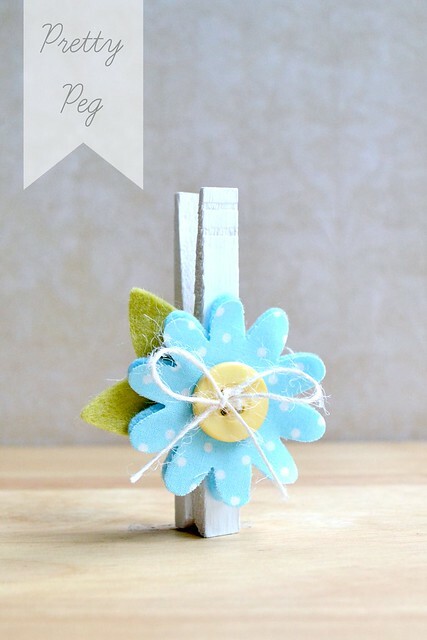 DIY supplies can make great embellishments for guy cards! 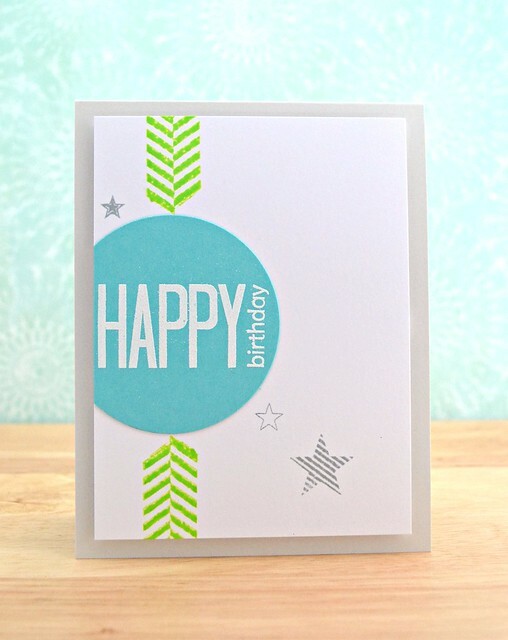 Texture is always a winner with cards for children! Sandpaper made a perfect beach/desert island but experiment with other materials such as flock and felt for a softer feel if you're not keen on the roughness of sandpaper. Just to add an extra finishing touch, I did indeed put a message in that little bottle/vial. If you use a larger vial, you may consider rolling up some money for some real treasure! 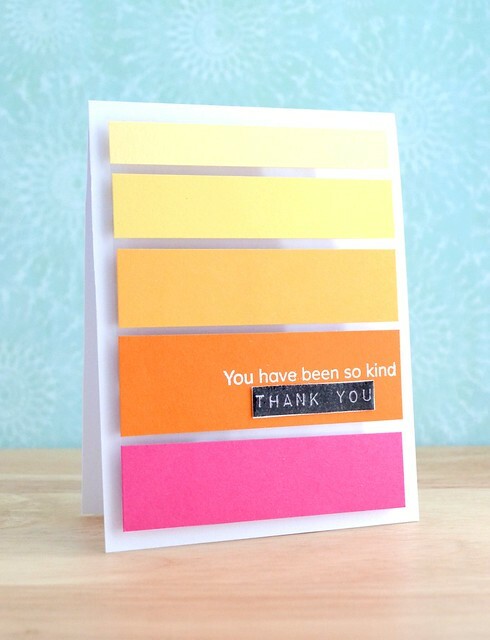 Thanks so much for stopping by today - your visits (whether they be directly here at the blogerooo, via email or via some other random feed) are always, always appreciated! I was totally floored by Jennifer's fabulous colour blocking. So trendy! I went for the same approach, injecting more summer colours into my design, (I was preparing for my hols when I made this card!) I also wanted to give the appearance of floating blocks of colour and experimented by mounting my design on a sheet of acetate. It's a pain to photograph, but looks kinda cool IRL! In order to exaggerate the floating panels of colour, leave a space in between each panel. The floating effect then takes place around all four edges of each panel. To guide your eyes to the focal point, place the sentiment panel on a bold colour and make the panel a larger in width than the others. Ooops! My embossing powder went a little crazy on the lower part of the sentiment but no worries; I covered my mistake by stamping the sentiment again in black ink on white card, trimming out the 'THANK YOU' part, and sticking it over the top. A good dollop of Glossy Accents also helps to convince you that it was part of the design all along....*wink*! Thanks so much for stopping by here today. I always appreciate your visits! Hoping to catch up with everyone and everything in Blogland when I return to normality (aka Home!). So roll on scheduled post number two of the week. By now I'm hoping that I've a good dose of gelato and I'm still sunburn free! 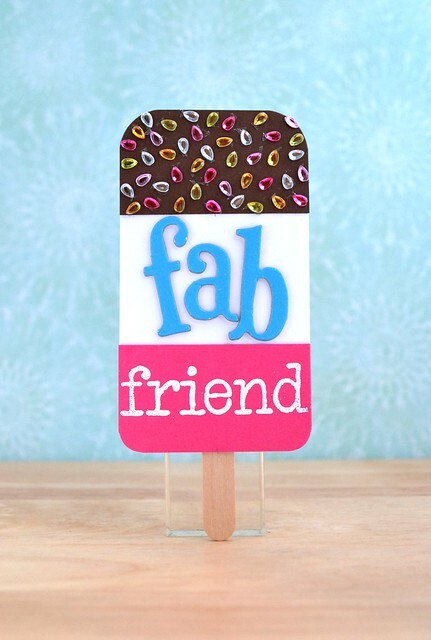 Today's 'fab' creation is a 'sweet' reminder about our challenge on A Passion for Papertrey. We want you to be inspired by something sweet! To create the sparkles, I snipped out the tear shaped gems of a patterned bling design. Don't be afraid to cut up patterned bling to make it suit your project! To add colour to my sparkles/sprinkles I used a Promarker on the clear gems. Easy! I purchase all my bling in clear and colour it to have perfectly coordinating bling no matter what. Now come on and be inspired by something sweet yoruself. You don't need to take a literal approach to the inspiration - just be inspired by something sweet in any way and get creative! One randomly selected peep will win a $5 Papertrey Ink gift certificate! More patterns than you could shake a stick at! 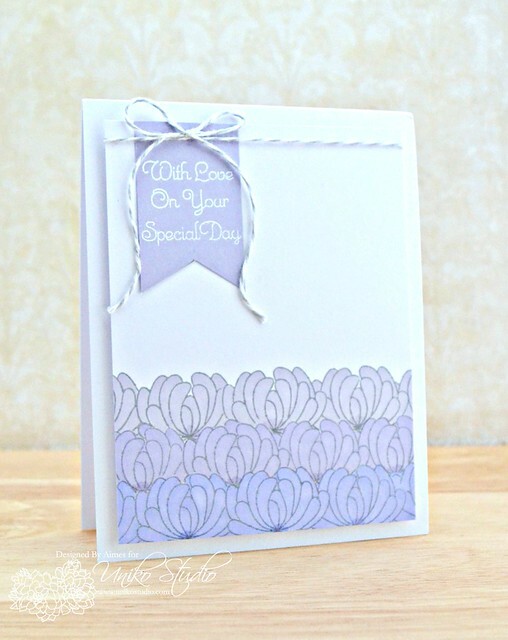 The tiny hearts are stamped from Flower Fusion #3 on to Pure Poppy card and cut out. I added some doodles with my white gel pen to decorate them. 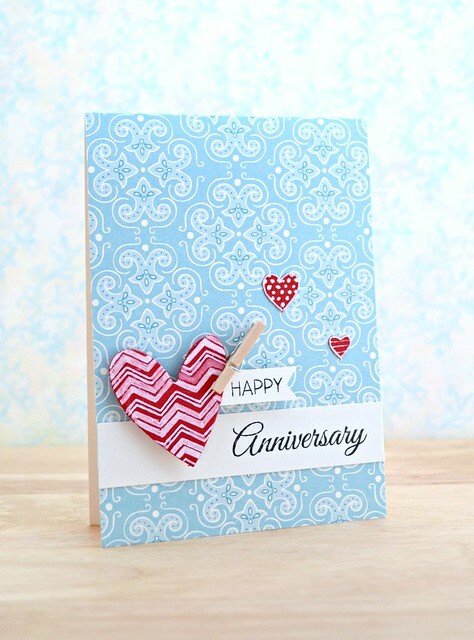 The big heart is a die cut spare I had and I decorated it with Background Builders: Chevrons. I was originally going to go plain and white with this card, but I'm still learning to embrace patterns and colours. Too much pattern on this? It didn't give me a headache to look at it....that's usually a good sign! Ha! If you don't have a blog to link back to the challenge, don't worry. Just use "USC"+ as your tag. For example, for our first challenge use "USC1"
Showcase any Uniko Studio product: clear stamps, dies, digital pattern paper, digital cut files, or digital stamps. If you haven't purchased any Uniko Studio products, fear not. Plenty of freebies here. Thanks so much for stopping by here today. Fingers crossed the rest of my scheduled posts work! I decided to add some trendy, striped triangles to my design with the aid of Post-It notes and CBS Basic Stripes. I simply marked a triangle with a light pencil, stuck two Post-It notes along the sides and stamped my stripes. Notice that I used bolder, thicker stripes for the bigger triangle and narrower stripes on the smaller triangle. That's intentional! The smaller triangle would look distorted with the thicker stripes in comparison with the larger triangle. For the ultimate mojo boost, be sure to check out what the rest of the CASE Study DT created - you won't leave disappointed! I was busy die cutting some sweet flowers for another project and whilst rooting through a drawer for something, I came across this sweet square of polka dot fabric given to me by my mum. I remember saying to her "I'm sure I can do something with it...." oh so long ago! So my eyes looked at this pretty fabric, and then to the Cuttlebug and back to the fabric. Eureka! Cue a very pretty polka-dot flower. Flower complete. What to do with it? Put it on a card? Attach it to a hair-clip? Make a brooch out of it? Nope. Attach it to a peg of course! I also attached a magnetic strip to the back of it. It would look so pretty on the fridge....if I had a fridge with a magnetic front! For now though, this sweet peg is perched on my desk lamp and is keeping a few papers safe. I think it's made its home there. :) Edited to add: it's not attached anywhere near the bulb! My lamp is much bigger than it sounds! Thanks for the warning, Caryn! To prevent frayed edges when die cutting thin material, place the material on some card to add an extra layer to your die cutting sandwich. This pretty polka dot material is very thin, so I die cut another flower from blue felt to place behind it for extra stability. Don't spend money on expensive pegs. Buy cheap wooden ones and customise them with acrylic paint (and don't forget, you can stamp on them too!). In order to paint the pegs with even coats, dismantle them and put them back together once painted. And do you know the sweetest thing about this project? Not a single stitch was involved/harmed in the process. Thank goodness for glue dots! Ha! As always, thank you for popping by here today! We're celebrating the fabulous release with a good ol' fashioned blog hop. You should have hippity hopped over here from the Uniko Studio blog - if you haven't be sure to start there and hop along; one lucky commentor will win the entire August release! Now today's card features that cool graphic flower die again. What can I say? I just love it so much! I created this almost lace border effect with it by die cutting half of the shape repeatedly. I like that it all sits flush against the white card stock and has an almost floating effect. Is it magic? Nope. It's the wonders of acetate. Mainly placing a layer of acetate behind a panel of cardstock and attaching my die cut shapes to it. Simple! When it comes to creating a border, I like to start in the middle first to ensure that the design is equally balanced on each side. This simply meant that I die cut half of the graphic flower die from the top centre of the white card before cutting it again either side. Acetate is the magic when it come to creating floating designs with ease. I could easily cut the full graphic flower from the middle of a piece of card, place acetate underneath and slot a separate die cut graphic flower in the aperture created from the first die cut. I adopted the 'gallon, quart, pint' design princple for this design. A good amount of pink, slightly less green and even less blue. It helps to balance the design. Now I won't keep you here as there's hopping to be done! Next on your tour of Uniko Studio goodness is Amber. Be sure to comment as you hop to be in with a chance of winning the entire August release! Thanks so much for hippety hopping by today! Ready for a new challenge, Clearly Besotted Stamps stylee? Yup, it's time to dig out your card, inks and CBS stamps to join in the fun with us! The mini-triangle is from the set Sky's The Limit - it's part of a kite. Look at the smaller stamps in your sets and see what patterns you can create with them. 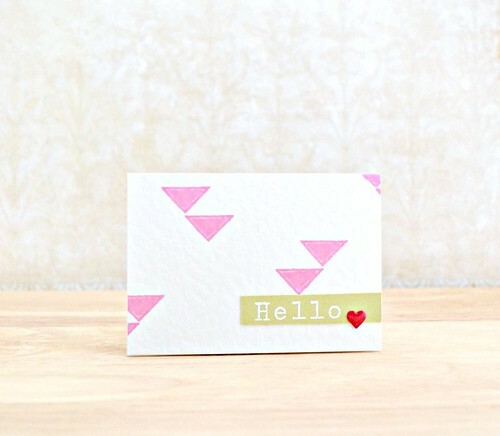 Now if you're new to Clearly Besotted Stamps, firstly, where have you been?! Ha! Secondly, don't fear! You can still play along as Stephanie has some free digi stamps you can use (change the colours of them using basic imaging software, or an online site such as PicMonkey). To get the full deets of the challenge and to check out what the super-duper CBS team have inked up to get your mojo ticking, pop across the the CBS Blog. Hooray for the weekend! I'm still ever grateful for the weekend even though I'm on my summer holidays as it means everyone else around me is away from work too! We'll be spending ours mainly holiday shopping as we're escaping the real world in a couple of week's time and we've got our newly engaged friends visiting to discuss wedding stationery (maybe I should start thinking about my own?!?!). I used Spellbinder's Square Nestabilities to whip up this frame for my card in a matter of seconds. Other shapes will work as well too - experiment! Don't take the shape of a die on face value - have fun seeing what other shapes you can create. Right, I'm off to make a list of things I need to buy for our holiday. Mainly suncream! Ha! Hooray for Friday! Hooray for more Uniko Studio sneaky peeks of the August release! I hope that you've enjoyed what you've seen so far. All products are available for purchase from Sunday August 11th! Today's card features the technique of masking. A whole lot of masking. Using a sweet flower from the set Flower Power #3. I love this graphic style little Chysanthemum and I couldn't resist using it to build a pattern. The sentiment(s) feature from Flower Power #3 too and I love the delicate swirly font - so fun! It's really handy to create a few 'masks' of stamps by stamping them on the sticky part of a Post-It note and keeping them safe with your stamp set after using them. I originally wanted to stamp the solid image of the flower to create an ombre effect, but the lack of coloured inks in my supply made me change my mind and use markers instead. 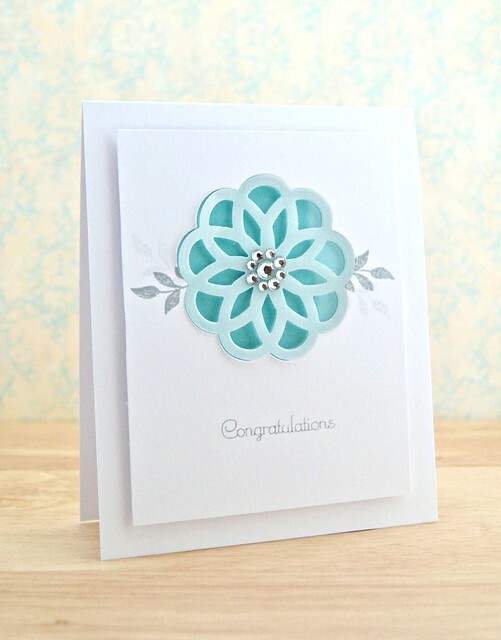 Stamping the outline flower in a grey ink rather than a black ink, keeps the design soft. 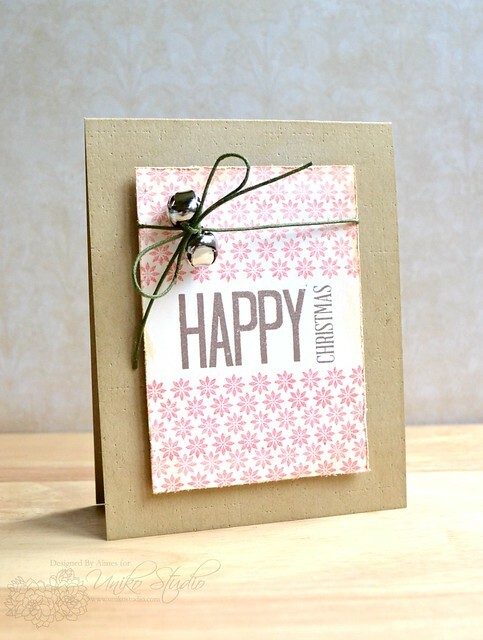 Mix and match sentiments from the same set to achieve custom sentiment. 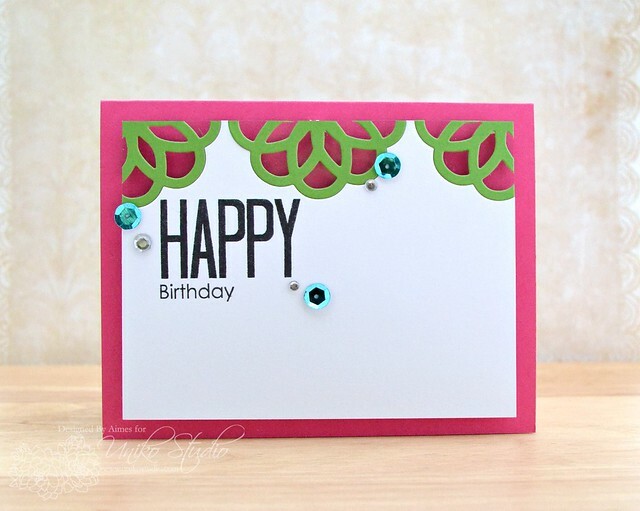 On this card I used three different sentiments from the same set! Don't forget there are mystery prizes up for grabs that will be announced on the Uniko Studio blog on August 11th. There are lots of ways to win, by commenting on the blog or a DT member blog during the countdown to release, Facebook, Twitter and Pinterest. As always, thank you so much for stopping by here today. I hope you have a great weekend! When it comes to stamping the rays, it's good to trace a light outline of where the circular panel will go. 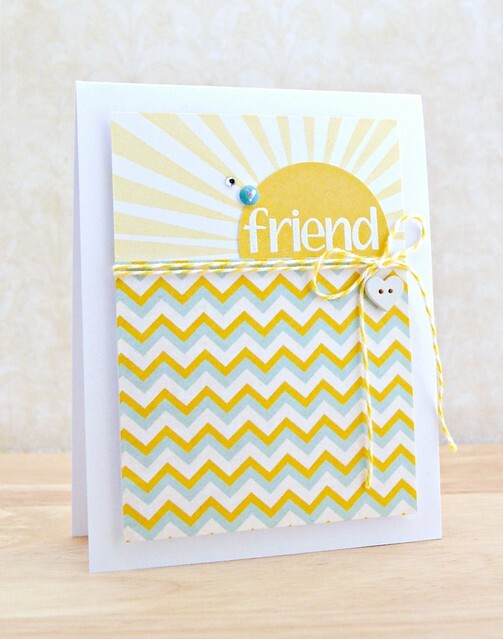 Use patterned paper from one collection to ensure perfect coordination. The circle was cut from a solid yellow sheet of paper in the same collection as the chevron patterned paper. And of course, I'm sure you want to see what the rest of the CASE Study DT whipped up too - you won't be disappointed! As always, please join the fun and study along with us. Who knew that studying could be this fun, eh?! Ha! Hooray for Wednesday! Apart from having my mum and brother visit today, and playing football later, it's also time for some Uniko Studio sneaky peeks! The Uniko Studio DT are featuring the fabulous new set, 'Background Builders: Flower Power' (Available for purchase from August 11th). Now for me, as soon as I saw one particular stamp, I was overwhelmed with visions of cozy winter jumpers with cool nordic-style patterns and before you knew it, my mind had jumped to Christmas. Oh I was *so* in that cozy sweater with a glass of mulled wine by an open fire! To add an extra warm, snuggly feeling to my card, I applied Vintage Photo Distress Ink to the card base and my focal panel. For extra texture, I embossed the card base using my most favourite impression plate ever and a paper distresser on my focal panel to ruffle the edges. If you don't have a paper distresser, scissors will do the same job! It's easier to apply distress ink to a piece of card first, and then to distress the edges with a tool/scissors. Sentiments don't have to sit vertically on a design. 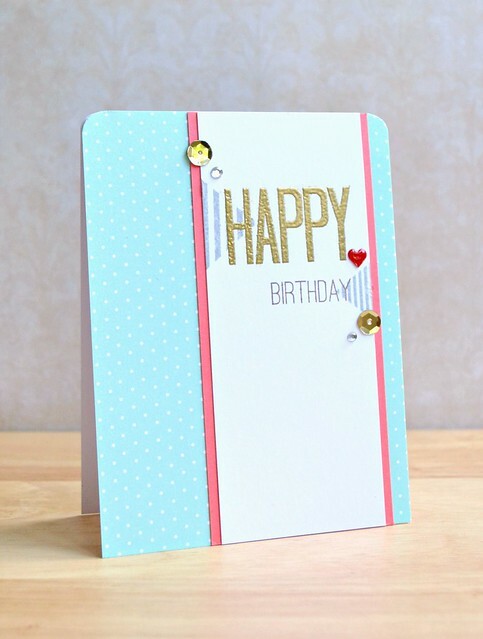 Have fun mix and matching sentiments from different sets and stamping them at different angles! Be sure to check out what the rest of the Uniko Studio DT whipped up with this great set - I'm pretty sure it'll only be here that features jingle bells today! As always, thank you so much for stopping by today. Stay tuned for more sneaky peeks of Uniko Studio's August release....! You should have arrived here from the fabulous Torico. If you haven't, then you wanna start out over at CASE Study. The idea of this hop, echoes the idea of CASE Study. We were simply given the brief to be inspired by something and go with the creative flow. Seeing as I'm a little bit of a Pinterest-a-holic I thought it was about time I actually used something that I've pinned to my 'Inspiration' board. Hmmm...decisions, decision.....! As soon as I saw this lovely print, I just knew I had to crack open my cool London Scene dies and get busy. As you can tell, I kept the design very simple and similar to the art print. 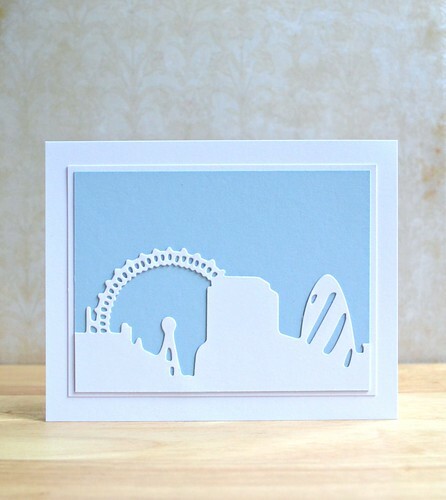 Only my version contains not a Ferris wheel, but the London Eye and 'The Gherkin'. But enough babbling from me, you need to hop along to my CASE Study teamie, Teneale Williams! Remember to comment as you hop for the chance to win some fabby prizes!